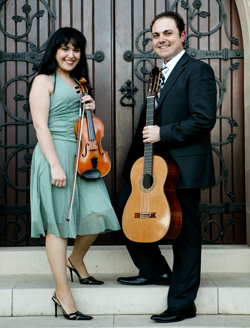 Victoria Jacono-Gilmovich (violin) and Giuseppe Zangari (guitar) in “Guivio Duo". Joseph Eisinger will play the Prelude from the Sixth Suite of Bach's solo suites for cello at the beginning of the concert. Giuseppe Zangari and Victoria Jacono-Gilmovich haved joined forces to form "Guivio", Sydney's premier guitar and violin ensemble, after having met at rehearsals for the acclaimed contemporary ensemble "Halcyon". 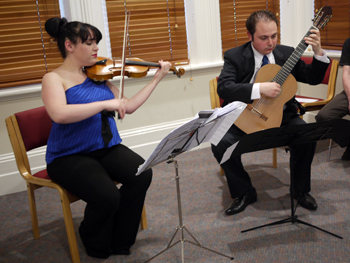 Guivio has been performing for 2 years, not only regularly in their own concerts but also as guests at charity events and musical festivals around New South Wales. Giuseppe is known for his passionate performances of romantic guitar repertoire by 19th Century Italian composers and is also an aficionado of South American and contemporary Australian guitar composition. In 2003, Giuseppe was appointed to the staff of the Newcastle Conservatorium of Music, where he is currently the Guitar Co-ordinator, lecturing in guitar. He regularly performs charity work on behalf of organisations including Amnesty International, Father Chris Riley’s Youth-off-the- Streets, War Child Aid, The National Breast Cancer Foundation, the Young Endeavour Youth Scheme and the Festival of San Giuseppe. Victoria also enjoys being actively involved in contemporary and Australian music. She works closely with many Australian composers to commission and help create new compositions, as well as regularly performing and recording new music. Since 2005, Victoria has been working freelance with the Sydney Symphony Orchestra, the Australian Chamber Orchestra, the Sydney Philharmonia Orchestra, Chronology Arts, Halcyon, Ilythian Ensemble, the Lurline Chamber Orchestra and the Australian Opera and Ballet Orchestra, alongside many performances and recordings for musicals, various pop artists and film productions.